So, remember how I said a few weeks ago in the caramel latte cake blog post, that I was making several birthday cakes for myself this year? Well, here is number two cake. This cake I made for my actual birth day. The third cake I had in mind, I haven't made yet. Between April vacation for the kids, and getting a horrendous cold that really knocked me off my feet, cake baking is at the bottom of my priority list. When really, it should be number one. Right? I wish. Anyway, this cake is divine. It's like Spring in dessert form. Our Spring has had a slow, cold start, but finally, the crocuses are blooming and the daffodils are close to revealing their bright and cheery yellows. 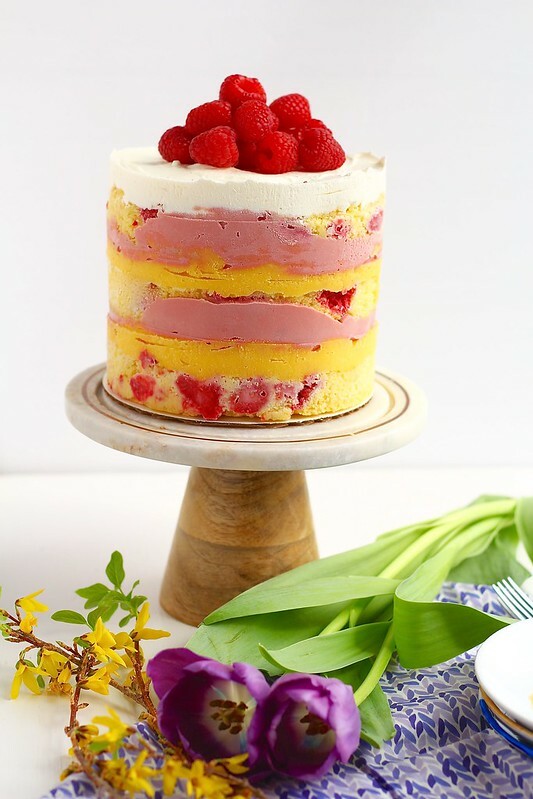 To break this cake down for you, the cake is a simple yellow cake that is studded with fresh raspberries and oodles of lemon zest. Then, a fresh and bright lemon curd is slathered over the cake. Because that isn't enough, a fresh raspberry curd is spread over the lemon curd. Because I thought frosting would be too much, I topped the cake with freshly whipped cream and a handful of fresh raspberries. If the description alone isn't enough to convince you to make this cake, then I don't know what is! 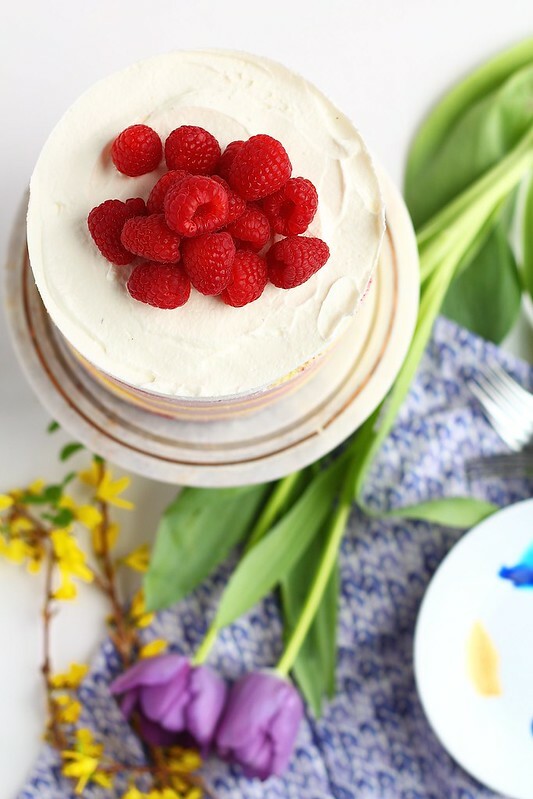 This is a perfect cake to celebrate Spring (especially for those who have had a late start to the season). 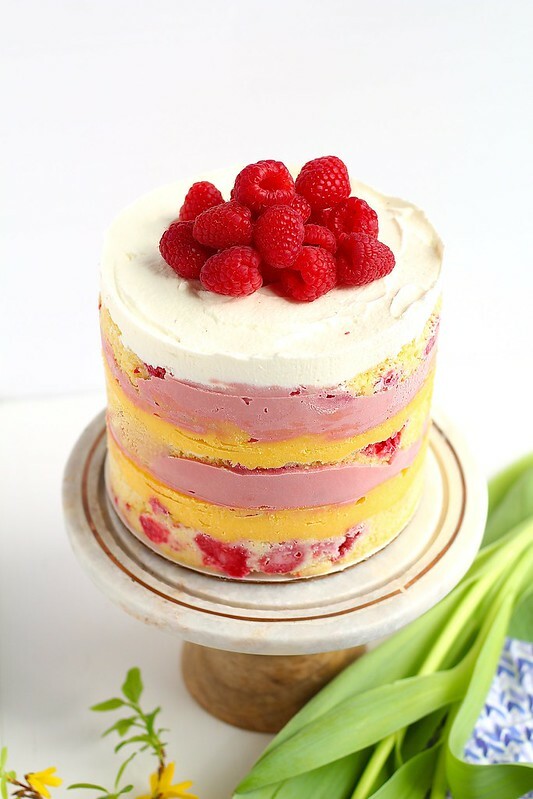 The cake isn't overly dense, but it is extremely satisfying with tart bursts from the raspberries and lemon, with just the right amount of sweet balance. On a side note, I realized that I haven't photographed the process of the cake assembly. If you haven't made these cakes before because you've been intimidated or whatever, I hope these photos will help break the process down for you a little bit. To make the cake, preheat the oven to 350ºF. Butter and flour the edges of a quarter sheet pan. Line the bottom of the pan with parchment paper. In a medium bowl, whisk together the cake flour, baking powder and salt. In the bowl of a stand mixer fitted with the paddle attachment, combine the butter, sugar and lemon zest. Beat together on medium-high speed until light and fluffy, about 2-3 minutes. Beat in the eggs one at a time, blending well after each addition. Mix in the lemon juice and vanilla extract. With the mixer on low speed, mix in half of the dry ingredients, just until incorporated. Blend in all of the milk, then mix in the remaining dry ingredients. Mix until no dry streaks remain. 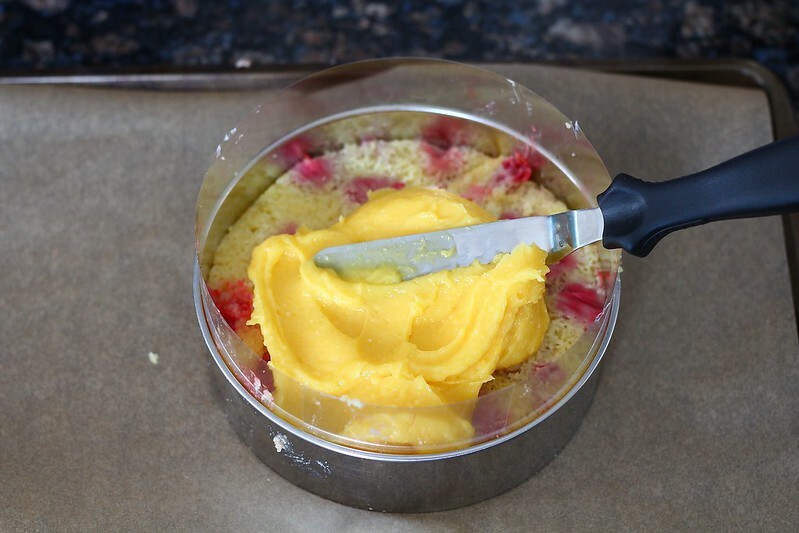 Gently fold the raspberries into the batter with a rubber spatula. Pour the cake batter into the prepared sheet pan, smoothing the top. Place in the preheated oven and bake for 35-40 minutes, or until a toothpick inserted in the center comes out with only a few dry crumbs clinging to it. Transfer to a cooling rack to let cool completely. To make the raspberry curd, pour the raspberry purée into a blender with the sugar, and blend until the sugar has dissolved. Add the eggs and blend on low until incorporated. Transfer the mixture to a medium saucepan, and clean out the blender canister. Place the water in a small bowl and sprinkle the gelatin evenly over the top, and let sit for a few minutes to bloom the gelatin. In the saucepan, heat the raspberry mixture over low heat, whisking often. It will begin to thicken as it heats up. Once it boils, remove it from the heat and transfer to the now clean blender canister. Add in the bloomed gelatin, butter, and salt, and blend until the mixture is thick, shiny and very smooth. Transfer to a heatproof container, cover and refrigerate until completely cool, at least 1 hour, or overnight. To make the lemon curd, whisk the lemon juice and cornstarch in a medium saucepan until smooth. Add the sugar, eggs, egg yolks, butter and lemon zest in the saucepan. Place over medium heat. Cook, stirring constantly with a whisk, until thickened and smooth, about 8-10 minutes. Be careful not to scorch the bottom of the pan by having the heat too high. The curd should hold the pattern of the whisk when stirred. Remove from heat and transfer to a metal bowl. Place plastic wrap over the bowl, pushing down so the plastic is touching the curd completely to prevents a skin from forming. Place in the refrigerator and let cool for several hours, or over night. 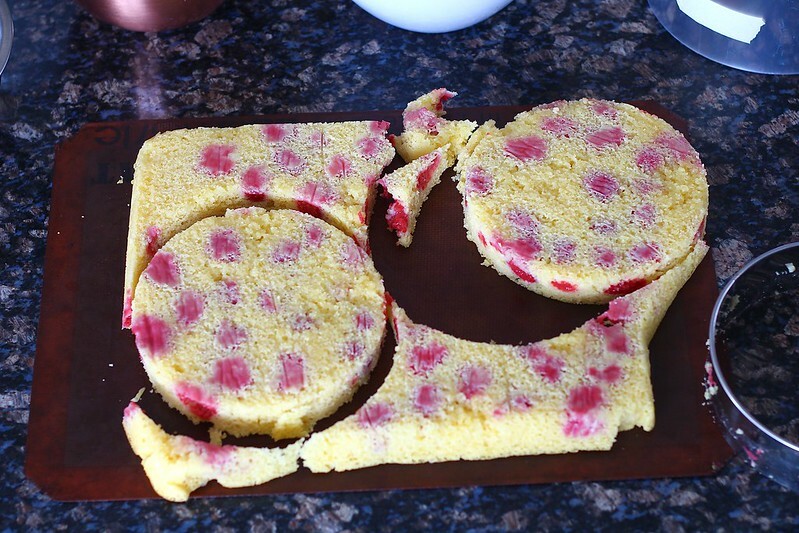 Wipe off the cake ring and place it in the center of a sheet pan lined with parchment paper or silpat. 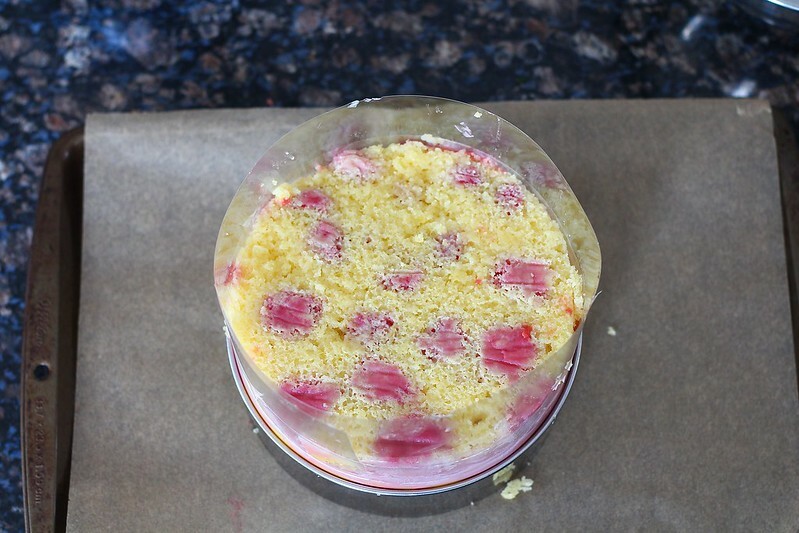 Use a strip of acetate to line the inside of the cake ring. 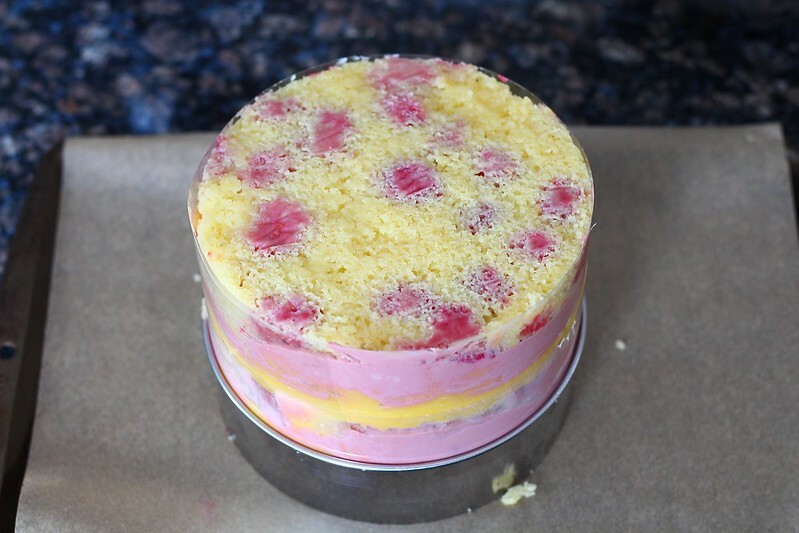 Use scraps from the leftover cake to place in the ring and press together in a flat, even layer. Spread about 1/2-3/4 cup of the lemon curd over the cake in an even layer. Spread half of the raspberry curd over the lemon curd in an even layer. Gently tuck a second strip of acetate between the cake ring and the top 1/4-inch of the first strip of acetate. 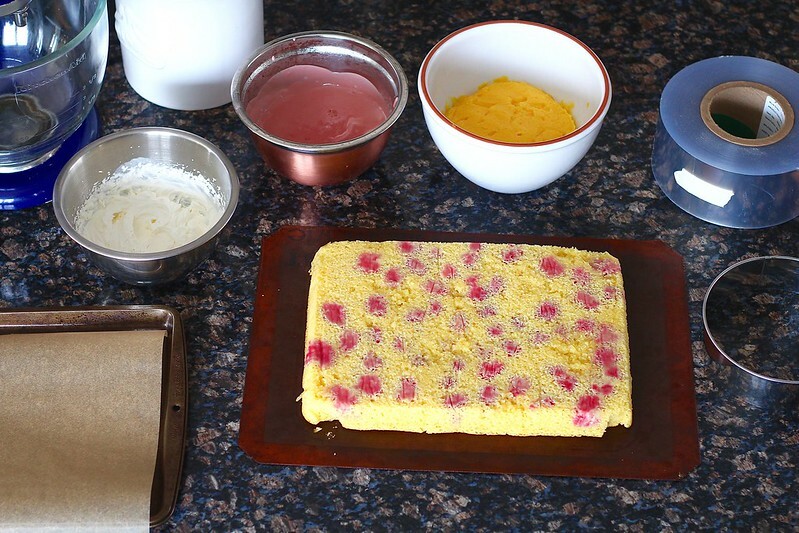 Set a cake round on top of the raspberry curd, and repeat the layering process once more of the two curds. 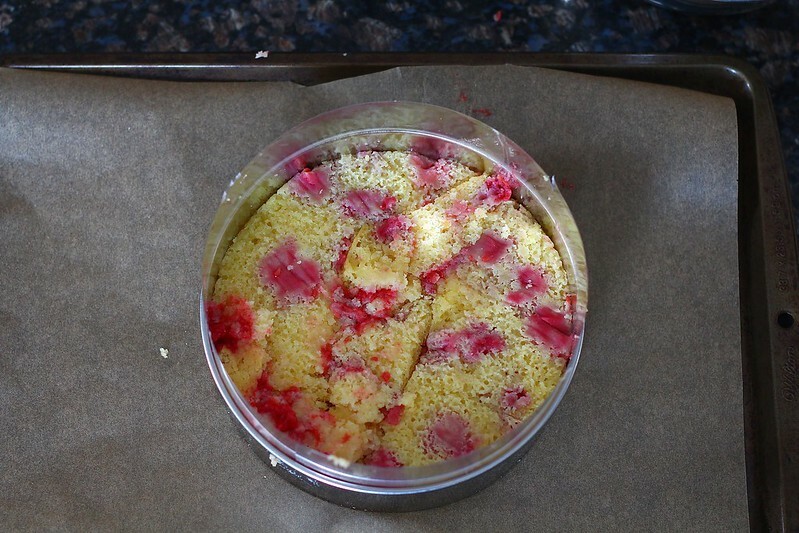 Place the remaining cake layer onto top of the raspberry curd. To finish, make the whipped cream. Pour the heavy cream, confectioners' sugar and vanilla extract into a small bowl. Us an electric mixer and whip the cream until stiff peaks form. Spread the whipped cream over the top cake layer. Transfer the assembled cake to the freezer and let chill and set over night. At least 3 hours before you are ready to serve, remove the pan from the freezer, pop the cake out of the cake ring, and peel away the acetate layers. Transfer to a cake platter and defrost for at least 3 hours. 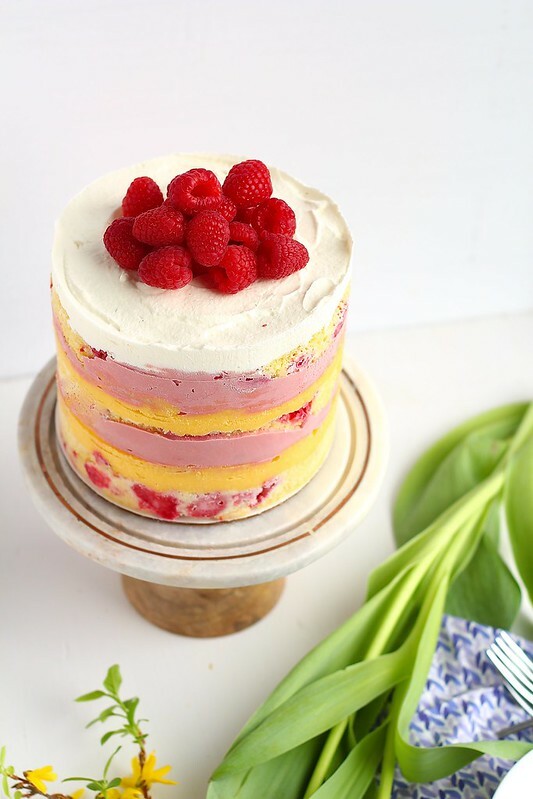 Top the cake with fresh raspberries right before slicing and serving.